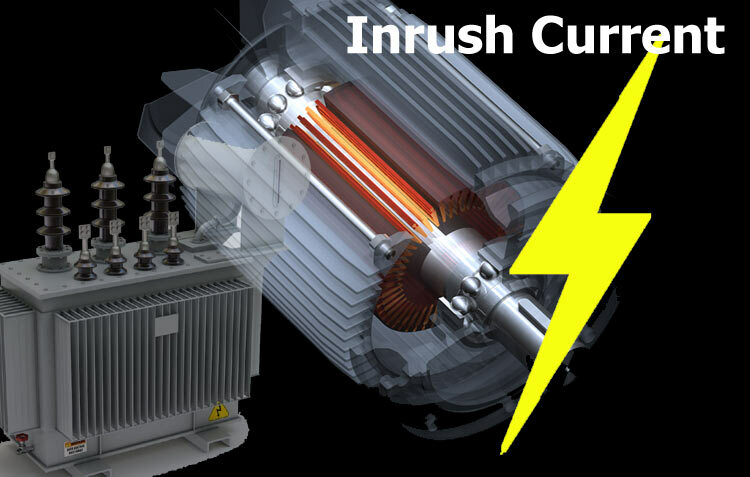 Inrush current is the maximum current drawn by an electrical circuit at the time it’s turned ON. It appears for the few cycles of input waveform. The value of the inrush current is much higher than the steady-state current of the circuit and this high current can damage the device or trigger the circuit breaker. Inrush Current generally appears in all the devices where magnetic core is present like transformers, industrial motors etc. Inrush current is also known as Input surge current or Switch-On surge current. Peak Current: It’s the maximum value of current attained by a waveform either in positive or negative region. Steady-State Current: It is defined as the current at each time interval remain constant in a circuit. A steady state current is achieved when di/dt = 0, which means the current remain unchanged with respect to time. Transformer inrush current is defined as the maximum instantaneous current drawn by the transformer when the secondary side is unloaded or in open circuit condition. This inrush current harms the magnetic property of the core and cause an unwanted switching of transformer’s circuit breaker. Like transformer induction motor do not have continuous magnetic path. Reluctance of the induction motor is high due to the air gap between the rotor and the stator. Therefore, due to this high reluctance induction motor requires high magnetizing current to produce the rotating magnetic field at starting. The diagram below shows the full voltage starting characteristics of the motor. As you can see in the diagram, starting current and starting torque both are very high at the beginning. This high starting current which is also called as inrush current, can damage the electrical system and the initial high torque can affect the mechanical system of the motor. If we reduce the initial voltage value by 50%, then it can result in 75% reduction of the motor torque. So, to overcome these problems soft start power supply circuits (mainly called as soft starters) are used. Should we care about Inrush Current and How to limit it? Yes, we should always care about the inrush current in induction motors, transformers and in the electronic circuits which consists inductors, capacitors or core. As previously mentioned, inrush current is the maximum peak current, experienced in the system and it can be twice or ten times of the normal rated current. This unwanted current spike can damage the device like in transformer, inrush current can cause tripping of the circuit breaker, every time it turns ON. Adjust the breaker tolerance may help us, but the components should withstand the peak value at in-rush. While in electronic circuit some components have specification to withstand with the high value of inrush current for a short time span. But some components gets very hot or get damaged if the value of in-rush is very high. So it’s better to use a inrush current protection circuit while designing an electronic circuit or PCB. For the protection from inrush current you can use an active or passive device. Choosing the type of protection depends upon the frequency of the inrush current, performance, cost, and reliability. Like you can use a NTC thermistor (Negative Temperature Coefficient) which is a passive device works as an electrical resistor whose resistance is very high at low-temperature value. The NTC thermistor connects in the series with the power supply input line. It exhibits high value of resistance at ambient temperature. So, when we turn on the device the high resistance limits the inrush current to flow into the system. As the current flow continuously the temperature of the thermistor rises which reduces the resistance significantly. Hence, the thermistor stabilizes the inrush current and allows the steady current to flow into the circuit. The NTC thermistor is widely used for the current limiting purpose due to its simple design and low cost. It also have some drawbacks like you cannot rely on thermistor in the extreme weather conditions. Active devices are costlier and also increase the size of the system or circuit. It consists of sensitive components that switch high incoming current. Some of the active devices are Soft Starters, voltage regulators, and DC/DC converters. These protections are used to protect the electrical as well as a mechanical system by limiting the instantaneous inrush current. The below-mentioned graph show the inrush current value with the protection circuit and without the protection circuit. We can clearly see how effective an inrush current protection is. How to measure Inrush Current? You all have seen the bicycle cart, to get it moving the rider needs to apply a vigorous force. And, once the wheel starts moving the required force get reduced. So, this initial force is equivalent to the inrush current. Similarly, in motors, once the rotor starts moving the motor starts reaching the steady state where it does not require high current to run. There are number of clamp meters (multimeter) available which offers inrush current measurement. Like you can use Fluke 376 FC True-RMS Clamp meter to measure the inrush current. Sometimes the inrush current shows a value which is higher than the rating of the circuit breaker, but still, the breaker does not trip. The reason behind this is, the circuit breaker works on a time v/s current curve, like you are using a 10 amps circuit breaker, so the inrush current which is more than 10 amps should flow through the circuit breaker more than the rated time of it.